History has a tendency to repeat itself. It has to, no one listens. However, if I am honest, I buy in to this cultural assumption every time I could say something, but keep my mouth shut. I am an aider and abetter to lies that entrench themselves in the minds and hearts of men and women. With God's help I am determined to get out of this cowardly attitude one day. Moreover, the History of the Quakers is also a salutary lesson for people like me involved in young church movements who can sometimes fall into the trap of thinking that the movement we are in has all the (best) answers. 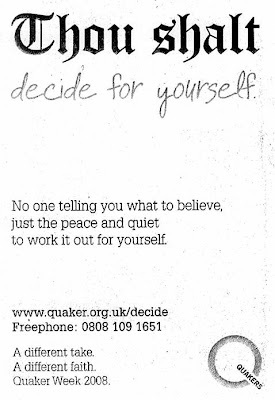 How the Quakers went from founders like George Fox to ads like this are fuel for very sober reflection and humble prayer.